Nurses can sometimes have a difficult time communicating with doctors, patients and even other nurses. Here are some tips to help nurses improve communication in some of their most challenging professional relationships. Nurses must relay important information to colleagues and supervisors, doctors and healthcare providers, patients, and concerned family members. Developing effective communication skills is a key element of a successful nursing career in healthcare. Learning to navigate potentially challenging workplace dynamics is crucial to maintaining the safety and well-being of patients and practitioners alike. In addition to creating a stressful work environment, communication difficulties can lead to adverse health outcomes and a potential increase in patient mortality rates. A study by The Joint Commission concluded that 70 percent of reported sentinel events had been caused by a breakdown in communication among healthcare professionals. For nurses, acquiring a skill set that includes effective communication is crucial and a critical component of advanced education and training for nurses. This article highlights some of the potential challenges in the nurse-patient, nurse-nurse and nurse-doctor relationships, as well as tips on how to navigate and work within difficult situations in the workplace. Patient care is at the heart of nursing, and a desire to help people is one of the reasons many enter the field. Nevertheless, the unpredictable nature of practitioner-patient dynamics often tests the professionalism of nurses. Nurses are meeting patients at their most vulnerable, which can create tension, fear and other difficulties. Breakdowns in communication between nurses and patients happen. For example, patients may have difficulty concentrating on what their healthcare providers are telling them in a stressful moment, or they may be too concerned about their medical issues or distressed by pain to give nurses their undivided attention. Nurses can be overwhelmed by the number of patients in their care and are expected to be on top of their tasks even in the tightest of time crunches. The need to multitask while checking on a patient is understandable, but slowing down and giving the patient your undivided attention may save time in the long run. Experts recommend sitting next to the patient, making eye contact and asking open-ended questions. Don’t dismiss patients’ feelings; instead, acknowledge that you understand their frustration. If a patient doesn’t seem to be listening or understanding instructions, try to find visual aids that may help him or her process the information. Nursing tends to attract a diverse group of individuals in terms of age, gender, ethnicity and background. Though this is one of the industry’s strengths, it can also pose certain communication challenges for nurses. For example, there may be generational differences in the approach to patient care and medical operations within the unit. Toxic or deeply stressful work environments can proliferate, which adversely affects nurses of all levels. In addition to potentially reducing the quality of care nurses provide, a dysfunctional work culture can also lead to staff turnover and absenteeism. This doesn’t actually mean going out for coffee with a colleague, though that could help. A “cup of coffee” conversation is a communication tool that can help nurses address a specific issue with a colleague. The goal is to focus on a single instance that may have created questions or concerns. Have this conversation in private and in a neutral location. Maintain a respectful and nonjudgmental attitude and briefly state the concern. It’s best to simply ask the other person to think about the situation. Finally, remind your colleague that he or she is a valued staff member. At its best, the relationship between a nurse and a physician is one of respect and collaboration. Unfortunately, there are certain dynamics at play that can make communication challenging. Despite the increasing responsibilities of nurses, many still perceive doctors as being at the top of a hierarchical chain of command. As a result, some doctors dismiss nurses’ expertise or minimize their professional advice. Nurses may then feel pressured to keep their opinions to themselves. In addition, some doctors are not always aware of the scope of a nurse’s role when it comes to patient care and the daily pressure that nurses are under. 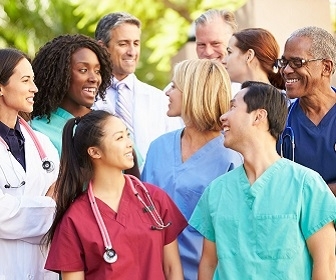 SBAR — Situation, Background, Assessment and Recommendation — is a communication technique to improve communication between nurses and physicians. This communication model allows you to organize your thoughts to convey information clearly, promptly and accurately. The first step is to briefly state the problem (the situation) to the doctor. Be sure to provide the doctor with all relevant information (the background). Then, share with the doctor what you believe are the potential causes of the problem (your assessment). Finally, be clear about what is required to address the situation (your recommendation). This framework allows nurses to communicate their concerns and needs to doctors while remaining focused on patient care. Nursing is an incredibly rewarding field, but it is also highly competitive. Interpersonal skills and effective communication strategies can go a long way toward building a satisfying career. Nurses can foster their leadership qualities by seeking higher education. Students in a graduate nursing program, for example, can develop advanced skills in conflict resolution, interdisciplinary collaboration and sophisticated decision-making by enrolling in an online Master of Science of Nursing after earning a Bachelor’s in Nursing degree. With a refined skill set and deeper knowledge, graduates will feel empowered to speak with more authority in front of doctors, colleagues, and patients, as well as to voice their concerns from a place of confidence. What are some of the challenging dynamics you are experiencing in your nursing relationships and what are your tips to make them better? Please share your thoughts in the comments below! American Nurse Today, “Not Just ‘Eating Our Young’: Workplace Bullying Strikes Experienced Nurses, Too"
American Nurse Today, "Promoting Professionalism by Sharing a Cup of Coffee"
DailyNurse, "Improving Patient Safety, Part 1: Communicating With Providers"
DailyNurse, "Tips for Communicating With Your Patients"
Nursing Center, "Nurse/Physician Relationships: Improving or Not?"